A data warehouse and data lake to store all types, shapes, and volumes of marketing data. A reporting & segmentation tool set. A workflow engine to bi-directionally sync data to and from the CDP. 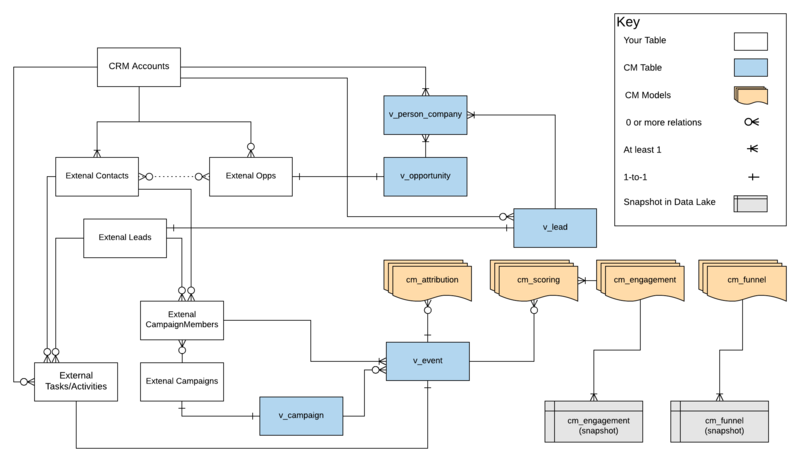 One of the benefits of centralizing analytics and segmentation in CaliberMind is that we automate maintenance of creating a "marketing data lake". For example, an important question is: What was an account's engagement score last month vs this month? What is our pipeline month-over-month, etc. This is only possible if you copy certain data as a snapshot each day-- which this model enables. It also allows interoperability. Our customers can leverage our best practice reporting templates on top of our system tables and snapshots regardless of custom objects, Salesforce, Marketo, HubSpot, SAP... or even Google Sheets. At a higher-level, many systems can integrate into this data backbone and it can be used to drive decisions and actions. For example you can import marketing campaign budgets from your CMO's spreadsheet and the Google AdWords API, and match ids in that spreadsheet to campaign ids in your CRM via `v_campaign`. This can be used in our Analytics Module to calculate ROI for each campaign. Each CaliberMind view is prefixed with v_. Admin user can modify system views in Settings >> System Views. Since system views are often complex, we copy the data from each view into CaliberMind system tables prefixed with `cm_`. This allows reporting to be much faster. There are cases when it makes sense to use 1 vs the other in queries, and lists. When building operational lists that need the most current data, use the views (v_), when building reports or bulk process where time-sensitivity is less important, use the tables (cm_) since they'll load faster and be less intensive on your data base. There are two categories of system views: parents and children. Parent system views end up as cm tables (see above). Children roll up date into parents. A UNION just mean adding data with the same columns vertically, to a data table. For example a parent v_event is a master view of events from other systems. A copy of your CRM leads table, however adds in Lead-to-Account matching. A copy of your CRM opportunity table, however adds in custom calculations for amount and probability. This is the primary profile table in CaliberMind. It's usually loosely based on CRM Accounts, Contacts, Leads, and Opportunities. Inferred org level based on title_clean. Inferred dept based on title_clean. Accounts without parents are their own parents. Leads matched to an account show the account id. Normalized Industry (e.g. "specialty stores" in would be "Retail"). Does this person have a closed opportunity. Taken from the from your CRM Account Type field (by default -- can be changed). Date of first closed/won opp. Value of first closed/won opp. Value of all won opps at the parent and all children accounts. Ranks 1 - to - n where 1st is the parent + children accounts with the most valuable as #1. Value of first won opp at an account. Value of all won opps at an account. Ranks 1 - to -n where 1 is the p.
Adds open opps at the account. Adds open opps at an account X the probability it will close. A unionized view / table of all events from all systems and their respective unique ids. This is the foundational timeline used for other models like scoring and attribution. Ex) "Salesforce", "HubSpot", "Zendesk" etc. [Optional] if there's a "type" field on the data coming in. Ex) "Even365" (or custom name for model used), other models will get added to this table too. A point in time aggregation of engagement score by Account. This table is snapshotted so as to spot trends in the data. The friendly name available for filter. Ex) Inbound90, Inbound365, etc. The number of days in the data set (ex - "90" would be 90 days rolling from the present day. Defaults to parent_id on the cm_person_company table. The lead or account id. Last Inbound touch at the account. Number of contacts with scored touches in the lookback (e.g. last 90 days. Last touch at account, parent or any related lead. Number of contacts at an account, parent or any other leads related that are engaged. Total touches at an account, parent, and any other leads. Top ranked account, lead, and parent account, #1 is best. Sum of scores at an account, parent, and any related leads. Top scoring account, lead, and parent accounts rank, #1 is best. Calculates day-over-day, week-over-week, and month-over-month comparisons of engagement score by account. Summarizes and snapshots each account or person_id in each stage of your funnel model created in the Funnel Builder. Attribution - CaliberMind versus Embedded Attribution in Salesforce?